" . . . Come back. Please." Alvin's plea amused us, although the other brief message he conveyed wasn't humorous: one of the EMTs had damaged an emergency vehicle soon after Jim left town. We were gone three days and Alvin already missed his closest ally in the squad and (I'm guessing) the person on whom he could most count for support and getting things done right. The subject of the letter is even funnier, considering he knows Jim will be gone three months: "Are You Back Yet?" Um, no. We're in Texas! Toto, we're not in Virginia any more. There's a Longhorn. And we got here in PR time, considering we're hauling a camper and had a slow start in the snow Tuesday morning -- two full days to Waco, a distance of 1,212 miles, and another 73 miles this morning to our campground at the Belton Lake Outdoor Recreation Area (BLORA) on sprawling Fort Hood, the second-largest military installation in the world. When I signed off Monday we had decided to get a good night's sleep and assess road conditions in the morning. We knew the season's first snow storm was probably heading our way, although we'd be near the southern edge of it if there was any accumulation. Our timing couldn't have been much worse to leave on this trip! Just how adventurous would this new adventure be?? We turned on the radio and TV as soon as we got up Tuesday morning. 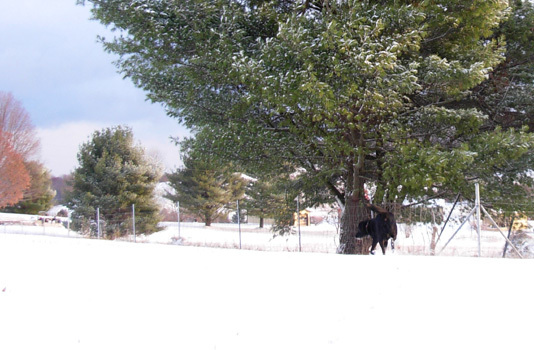 Yep, up to six inches of snow had already fallen in the mountains in West Virginia. There was less in the Blue Ridge just west of Roanoke, but 2-3" were on the ground in the New River Valley along our route, I-81, south and west of town. We were just starting to see flurries at our house 15+ miles east of Roanoke. Should we leave now or wait another day for it to melt? We were more than ready to go, both psychologically as well as logistically, that "all dressed up and nowhere to go" feeling. It has been over nine months since we came back from the Southwest in February, the longest period of time we've remained at home since Jim retired almost five years ago. We still regret our decision to stay home last summer. We'd have been like caged animals if we postponed this trip even one more day. 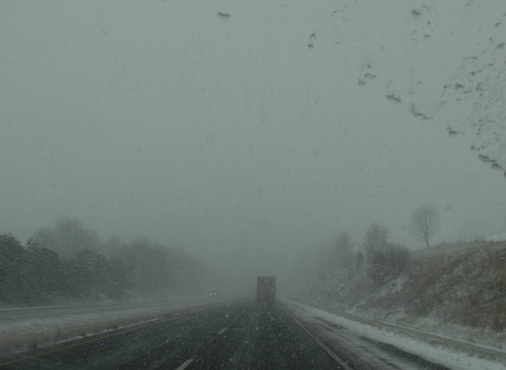 The first six winding, hilly miles should be dry, we rationalized, and the more heavily traveled roads through the city and on the freeway should be clear with all the traffic melting any snow that might have stuck (the weather had been warm prior to the storm). News reports reassured everyone that VDOT was in control of the situation, ready and able to put out sand or whatever chemicals they use on roads these days. At 6:30 AM we shut off the water, turned down the thermostat, finally allowed Cody to hop into the truck (like Tater always did, he stayed very close to the camper while we were packing it! ), locked the doors, and headed out the driveway. 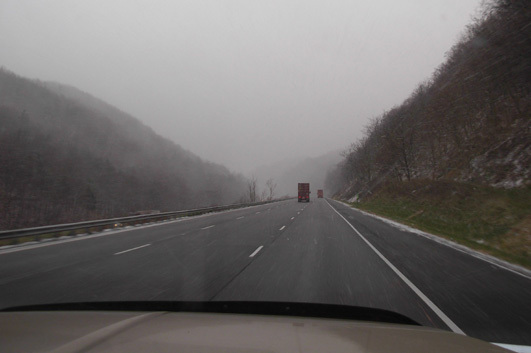 By the time we got into Roanoke it was snowing more heavily. About an inch of snow had already accumulated on the ground, up to 3" an hour south of town. Cody had fun playing in the snow at a busy rest area near Claytor Lake State Park. We haven't seen this much snow since post-holing on the Colorado Trail two summers ago. We were in and out of blowing snow and sunny, clear skies the first two or three hours. As a consequence, the roads were alternately wet and dry. We lost some time by driving more slowly than usual but safety was paramount. We didn't have any deadlines to meet. We saw only one accident the whole way to Texas. 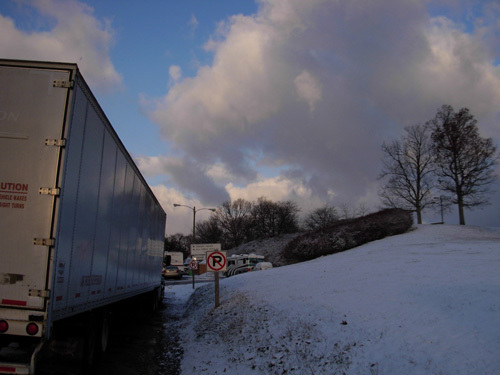 About an hour south of Roanoke a jack-knifed semi was on one side of the road and a pick-up truck hauling a trailer was in the median facing the wrong way. Neither looked very dinged up; hopefully, no one got hurt. Emergency vehicles had not arrived yet. Soon after reaching Tennessee in mid-morning the weather cleared and we had two beautiful, dry, warm, sunny days to Texas. In retrospect, we're glad we left when we did. There were many prettier areas than that through the mountains between Bristol, Virginia and Nashville, TN on I-81 and I-40 but I didn't think to take pictures there. It was fun to be on the road again. Once past the snow in Virginia, the weather was clear and we didn't run into much road construction or heavy traffic. We covered a lot of ground on Tuesday (673 miles in 12+ hours from home to W. Memphis, AR) and Wednesday (539 miles in 9+ hours from W. Memphis to Waco, TX). That included several stops at rest areas, Flying Js, and Steak 'N Shakes (Jim likes those and we don't have any in Virginia). Another 70 miles on Wednesday morning got us to our first camping destination at Belton Lake on Fort Hood. In the last entry I mentioned the Visa gift cards Jim received Monday night as reimbursement for his mileage running rescue squad calls this year -- we used them exclusively for diesel fuel at Flying Js all the way to Texas. With our free member card we get a discount of one to three cents per gallon. Flying Js are the most convenient and least expensive truck stops/gas stations we've found on trips. Most of the ones we've used across the U.S. have dedicated RV pumps, dump stations, free water, and areas for campers to stay overnight. We were pleased when diesel fell to $2.75/gallon in Roanoke before we left. We were even more pleased to find it getting cheaper as we drove west! That may be because the cost is still falling around the country, not that it's cheaper in Tennessee, Arkansas, and Texas. Virginia's fuel taxes are fairly low, comparatively. Last December it was $3.15/gallon in Roanoke and more expensive the farther west we got, especially in Arizona. This was a nice switch. This week we paid between $2.54 and $2.62 per gallon along I-81, I-40, I-30, and I-35 and "only" $2.49 on post at Fort Hood. We have enough left on the gift cards to get us to Arizona if we were going there directly (we aren't). "Camping" was free both nights to Texas, too. On Tuesday night we parked near several other RVs at the Flying J just inside Arkansas on I-40. There was a nice grassy area for Cody to run. The parking area appeared safe but wasn't as brightly lit as most Walmarts are. We drowned out the freeway noise with ear plugs and stayed warm even though it got down to a brisk 29 degrees. The next morning I bundled up in fleece pants, jacket, gloves, and ear warmers to walk Cody outside. I returned to the camper and found Jim wearing SHORTS and a short-sleeved T-shirt! He could see the sub-freezing temperature on our indoor-outdoor thermometer. I looked at him like he was nuts and he declared, "I'm on vacation." Ha! You could argue that folks who are retired are always on vacation, but you'd be wrong. I used to think that, too. I know better now. We are definitely more relaxed when we are traveling in the camper. Yes, there are still some hassles when we're on the road but there isn't something begging to be fixed or cleaned all the time when we are traveling -- no home repairs, no yard work, no cutting and hauling wood and keeping the fire going, no snow removal, no EMS calls in the middle of the night to interrupt our sleep. We almost always sleep better and longer in the camper than we do in our comfy bed at home -- even in a Flying J, Walmart, or Sam's Club parking lot! Sam's Club -- that's where we stayed the second night. Jim wasn't as crazy for wearing shorts on Wednesday morning as I thought. By the time we reached the NE Texas border I was in shorts, too. It was 80 degrees in Dallas mid-afternoon when we drove through there. That's 51 degrees warmer than it was a few hours earlier. Kinda like Roanoke's weather the last couple months: wide swings of temps from colder to warmer than average, but not usually in six hours. We reached Waco about an hour before sunset on Wednesday and decided to stay at Sam's Club instead of trying to locate a campsite in the dark at Fort Hood. We were the only RV there and had several choices of where to park (we asked first). We picked a darker, quieter side of the building where trucks delivering goods wouldn't wake us up. Sam's Clubs don't stay open all night so they are quieter than Walmarts. Jim's been eyeing various Garmin and Magellan GPS units for our trips but hasn't found a real "steal" yet. One of those would be nice to show us how to locate Walmarts and Sam's Clubs once we exit the freeway. The main way we've been locating them in transit is Walmart's version of the USA Rand McNally road atlas that lists all the stores. Ones that are closest to freeways give the exit number, but most just have the address. If we know for sure where we'll want to stop driving for the day, we can locate the address on our Topo software on the computer. But we're usually in transit when we decide we've had enough fun for one day and often have to guess which exit to use and which way to turn at the end of the ramp. Sometimes Jim sets his handheld GPS on the dash while we're driving but it just tells us where we are, not how to get to our destination. We'll consider getting a vehicle version if we find a good enough sale during the holiday season. Heck, three or four free overnight "camping" sessions and we'll have the GPS paid for! As the economic depression deepens every company except Walmart is hurting financially and predictions are for excellent deals on consumer products this winter. We've already taken advantage of great markdowns on a computer package and camera. What else can we find?? 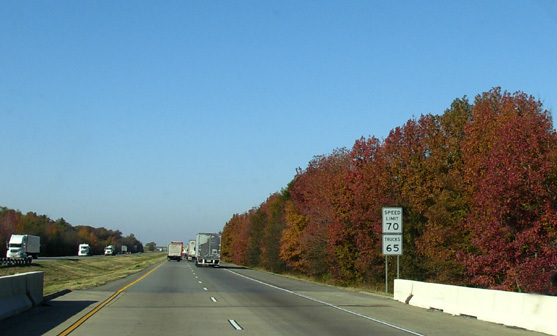 Most of the drive through Tennessee and Arkansas looked similar to Virginia: winding and hilly with colorful deciduous leaves. By the time we hit Texas, we knew we'd traveled a good distance even though we were only one time zone away. 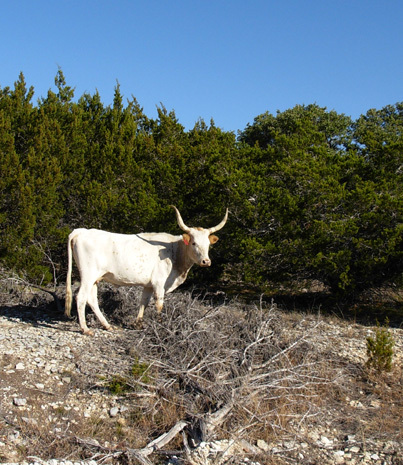 There are the oil wells, the increasingly vast range land, the longhorns, the different kinds of trees and shrubs, the prairie-morphing-into-desert terrain. Fort Hood, between Waco and Austin, appears to straddle that farm-desert line, with features of both. Since we've never been to the camping areas at Fort Hood before we weren't sure which unit we'd prefer, if there was still a choice (you can't make advance reservations). 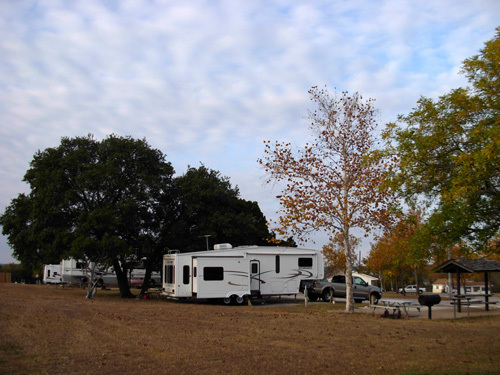 The huge Army post has two family campgrounds, one on the southwest edge near Killeen and one at Belton Lake, above, which is ten miles or more from the nearest towns or gates into the inhabited part of the post. 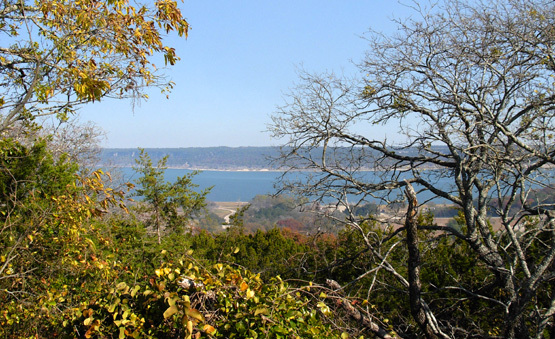 Information we found online and via phone calls indicated Belton Lake would be the more spacious, quiet, and scenic choice. Since it has three distinctly different camping areas within it we wanted time to drive around before making a decision, something we couldn't do after dark last evening. That's why we hunkered down overnight in Waco. This morning we awoke to another bright, sunny day. It took a little more than an hour to maneuver through some road construction on I-35 in Waco and Temple before heading west to Belton Lake. 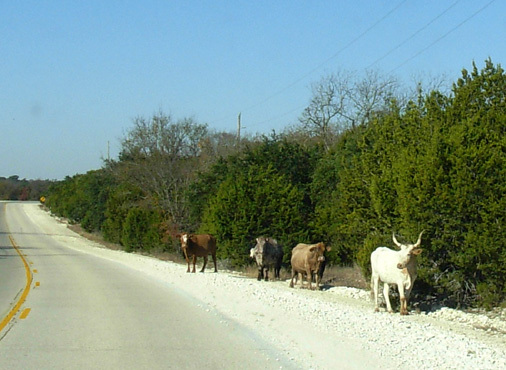 I took the cattle photos in this entry along Sparta Road near the entrance to BLORA, the 800-acre Belton Lake Outdoor Recreation Area. 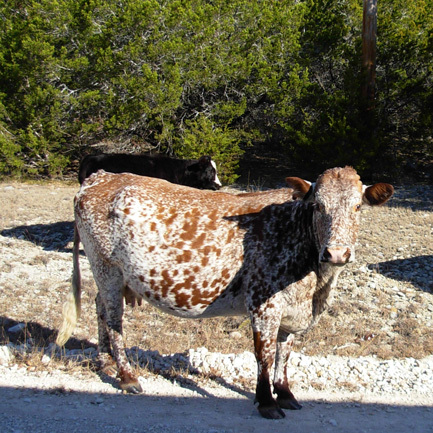 Cattle roam free-range on the massive Fort Hood complex outside the main post, sharing the scrub land with soldiers launching missiles and practicing war tactics. There are cow patties all over the mountain bike trails where we'll run at BLORA but the bovines can't get into the camping and recreation areas. Neither fences nor cattle guards deter deer, however, so those critters have free reign inside the park. We showed our military IDs at the office and talked to the staff about our campground choices. They gave us maps of the three camping units in BLORA and indicated which sites were available. In the next entry I'll describe the recreation and camping areas in more detail. For now, the bottom line is that we chose the Cottage RV Area where there are eleven camper sites with full hook-ups and about the same number of wooden cottages for rent. We like it here; this will be our home for eleven days. Now it's time to go explore the roads and trails!